Property 35: The Villa Delicious: Great location, exotic, swimming pool, tropical garden. Property 37: Hyacinth House/ubud/best Breakfast In Bali! Exotic artistic house. Sleeps 4-5. Private swimming pool in tropical garden. Property 40: Exotic artistic house. Sleeps 4-5. Private swimming pool in tropical garden. We spent 6 wonderful days in this lovely home. Our journey began when the house manager told us &ldquo; just enjoy; you are King and Queen&rdquo; and we were treated like royalty. She came every day to make us a delicious breakfast. She was extremely helpful and assisted us with making plans and securing a personal driver to take us around to various sights. For an extra fee she made us dinner on 2 of the evenings. She also made sure that we had adequate transportation into town for the days that we went in. 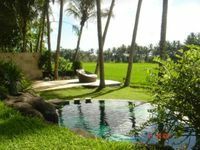 The grounds were immaculately kept and the pool was an excellent addition to the home. The only reason for 4 stars and not 5 is because of a few hiccups that were easily dealt with. A taxi that was arranged for never came and the gas ran out one day so no hot water for the shower. The tank was changed that day, but there was a problem with the gas line to the stove so we couldn&rsquo;t use it to cook dinner and we had already bought groceries. We got by and the house manager was very apologetic. Overall we felt very secure, well cared for and had an excellent vacation. 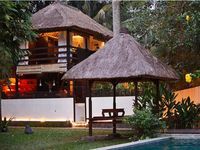 I would definitely stay at this house in the future and highly recommend it when staying in Ubud.